SFBA MBCA is sponsoring a MERCEDES CORRAL at the Mission Classic Car Show this year on August 22nd , the Wednesday of the 2018 Monterey Car Week. 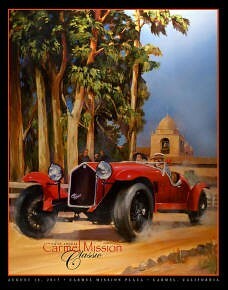 The Mission Classic combines an elegant collection of notable and interesting cars, a gourmet food bar, wines from several local wineries, all on the beautiful and historic grounds of the Carmel Mission. SFBA MBCA Members can participate in the Mercedes Corral, located directly in front of the Mission, for $135.00 ($15.00 savings), for one car and two admissions. Members can also purchase single admissions, without corral parking, through the Mission Classic web site.